The menu that creates input for "Select a country" & "Select a region" options in the "Post adverts" form. Additionally these inputs are used in the search module too. - Select Components => Jom Classifieds => Locations => New. See the following form below. - Fill in the following form as per the following instructions. Name Name of the location you'd like to add. Eg : United Kingdom. Alias Enter the alternative name of your location. Parent Select whether the location added is "Main region" or the "Child" of another location. 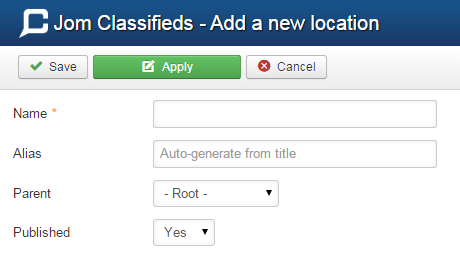 Published Option to enable or disable the category. - That's it. Save the form. You have successfully added the location.